1. After infighting between great Yadava kings, and subsequent submergence of Dwarka, Yadavas fled to safer places, and founded their own Kingdoms. 2. In Delhi a kingdom was founded under Lord Krishna's Great Grandson Vajranabh with the help of Arjuna and later Parikshit. 3. Velir Kingdom in Tamil Nadu was founded with the help of Sage Agastya. 4. Kalinga Empire was founded under Indradyumna. 5. Kashmir empire was founded with the help of Arjuna. 6. Magadh empire later came into prominance under Yadavas. 7. Lord Krishna's son Samba's Descendants had already founded their own kingdom in current city of Multan in Pakistan. 8. Satyaki's Grandson Yugandhara became king of territories near Saraswati River, mainly in Current Day Haryana. 1. Although Dwarka kingdom was lost, But the help Krishna extended to the Pandava Yudhisthira, paid off. 2. When the rule of Yudhisthira ended, he established the Yadav prince Vajra on the throne of Indraprastha along with the Kuru prince Parikshit, at Hastinapura. 3. Thus the royal lineage of the Yadavas continued through Aniruddha's son, prince Vajra, great grandson of Krishna and grandson of Pradhyumna. 4. Parikshita was the son of Abhimanyu and the grandson of Arjuna and was also grandson to Yudhisthara, son of Draupadi's daughter Sutanu and Asva, Krishna's son by Jambavati. 5. Similarly, Satyaki's daughter's son Bhuti who was grandson of Bhima and founder of Malavas was made king of Saraswat nagar. 6. Krishna and Rukmini's daughter was married to Bali, son of Kritavarma, whose son Andhaka got Mrittivakata. Bali was nephew to Yudhisthara and Duryodhana, married to their sister. 7. Another son of Jambavati, Samba 's son, cousin to these three founded Moolsthana or Multana. 8. Pradyumna, Krishna's son, Krishna's brother Gada and Samba had married three daughters of Vajranabha and shared his kingdom. 1. Lord Krishna had been to the Pandyan land and was present at the sangam at Kavaata puram. Lord Krishna had matrimonial relations with them as He married with Nappinai (UpakEsi) from the Pandyan land. 2. Lord Krishna fought with the Pandyan king and defeated him. And later in Mahabharat War, Pandyan Prince, Sarangadhwaja joined the army headed by Dhristadyumna's son, Kshatradharman, in favor of Pandavas. 3. Before the Destruction of Dwarka, Lord Krishna's descendants Velirs and 18 clans of yadavas departed from dwaraka with sage agasthya. 4. 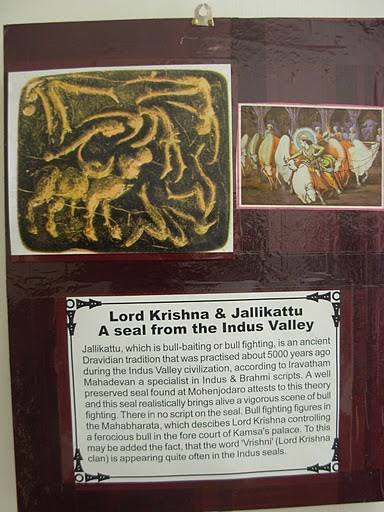 These Yadavas of Lord Krishna's clan went to tamil land mullai. Some other yadav establishments occurred in present day Orissa. Those who went to Orissa founded the Kalinga empire under Indradhumna, Kalinga was devoid of a ruler after kalinga king was killed in Mahabharat War by Dhristdyumna the army chief of Pandavas. 5. Agasthya went to Dwarkapathi and brought back with him 18 kings of the lineage of Krishna who measured the land (as Thrivikrama), 18 families of Velirs and AruvaaLars and had them settled in the lands by clearing the forest tracts. 7. Important line of chieftains of Tamilnadu during the sangam period with whom Lord Krishna was intimately associated was the Ayars. 8. There were many velir chiefs in the tamil country during sangam period. They had Ay prefix and prominent among them were Ay-andiran and Ay-Vel. They had their capital as Ay-Kudi and ruled the potiya region. The Ay chieftains from the Yadava lineage had their settlements which were known as Ayarpadi. 9. There were twelve to thirteen Vēḷir dynastic families of fame in the Sangam age. Seven kings from seven dynastic clans of the Vēḷir royal house formed the Kadai Ezhu Vallal (The last of the 7 (lines) of Great Patrons), liberal patrons of arts and literature in ancient Tamilakam. 10. The Kongu Vēḷir dynasty ruled Kongu Nadu, while the Vēl Pāri dynasty produced numerous kings ruling Parambu Nadu, the most popular of whom was a close friend of the poet Kapilar. The Irunkōvēl line ruled over Ko Nadu and their most famous ruler, Pulikadimal, was a contemporary of Karikala Chola and Kapilar. The most heralded of the Āviyar line was Vaiyāvik Kōpperum Pēkan, a contemporary of the poet Paranar, and renowned for his generosity. The Malayamān Vēḷir dynasty ruled Nadu Naadu around Tirukoilur, their royal emblem featured a horse and their most famous king was Malaiyamān Thirumudi Kāri. Both he and his son Thaervann Malaiyan assisted the early Cholas and Cheras. The most famous Vēḷir dynasty was the Athiyamān dynasty, and this dynasty's powerful and most famous king was Athiyamān Nedumān Añci. His son Elini ruled Kudiramalai of the ancient Jaffna kingdom and Vanni, a co-ruling contemporary of the famous king Korran. These kings belonged to a prolific Tamil horseman tribe. The ancient Tamil Naka Oviyar tribe of the Vēḷir house, whose nation stretched to the Tamil emporiums of Mantai and Kudiramalai, had the famous king Nalliyakkotan who ruled this region and is paid tribute to in the Ciṟupāṇāṟṟuppaṭai. 11. Each of the Vēḷir dynasties ruled from their own capitals and utilized the seaport of Arikamedu. 12. Vēl Pāri was the title of the line of Tamil Vēlir Kings who ruled Parambu nādu and surrounding regions in ancient Tamilakkam. The most famous among them lived towards the end of the Sangam era and was the patron and friend of poet Kapilar. He is remembered as one of the Kadai ēzhu vallal (literally meaning, the last of the 7 (lines) great patrons). He was the master of the hill country of Parambu nādu and held sway over 300 prosperous villages. The Parambu nadu covers the modern day cities of Gobichettipalayam and parts of Coimbatore and Erode. Pariyur, named after Pari himself is home to the great temples Sri Kondathu Kaliamman Temple, Sri Amarapaneeswarar Temple and Sri Adhi Narayanaswamy Temple. 13. During this period, the three crowned Tamil kings were in the process of expanding their kingdoms and turned the other independent Vēlir Kings into subordinates and assimilated their kingdoms. When they finally lay siege to the heavily fortified country of Parambu, Vēl Pāri would refuse to give in and the war would drag on for years. On one occasion, Kabilar would approach the three crowned kings and describe his patron as an unconquerable warrior and ask them to turn around. After a long drawn out war, Vēl Pāri was be killed by treachery. 14. Another Velir was Irunkōvēl (Purananur-201 by Paranar) who ruled from Koval (modern day Tirukovilur) on the banks of the Pennai, (the present Ponnaiyar River) which presently discharges into the sea at Cuddalore in Tamil Nadu. It is likely that the course of the river has changed to the south over many centuries. 15. Other Velir chiefs of repute include Alumbil Vel, Alandur Vel and Nangur Vel. In Sangam literature the more prevalent word used is Vel, such as in the names Vel Avi and Vel Paari. 16. Lord Krishna fought with 7 seven bulls to marry the princess Nappinnaiin in a swayamvar. This tradition flourished in the Velir Kingdom, and In now Indian State Tamil Nadu, Jallikattu(bull fight) is a Yadava festival, which when started in earlier times, a Yadav boy if he wanted to marry a Yadava girl he had to fight with a bull, and if he wins then only that girl married him. Now all caste people participate in this festival.